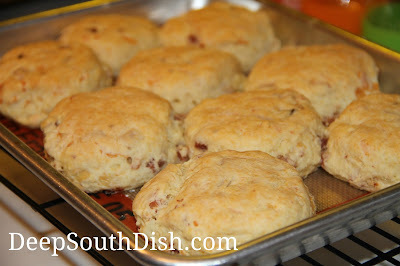 A tender biscuit stuffed with smoked honey ham and shredded cheese. 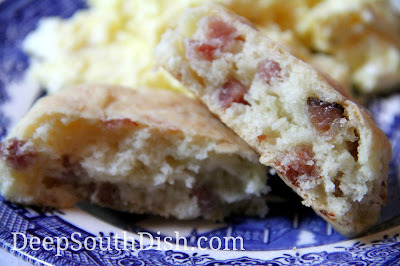 These are great breakfast or brunch biscuits served alongside some fluffy eggs or even as a base for an egg sandwich. I like to use a sweeter honey ham for these, but any good smoked ham works fine too. With the self rising flour, ham and cheese, I don't usually add any additional salt, so do keep that in mind if you're tempted to add some. Make mini biscuits for that next party and serve with some good pepper jelly - yum y'all! Preheat oven to 350 degrees F. Combine 2 cups of self rising flour, 3/4 cup chopped smoked honey ham and 1/2 cup of shredded cheese - I usually use Cheddar or Monterey jack, but use whatever cheese you like. Add a little chopped jalapeno for a nice punch! Make well in center and pour in 1/3 cup of cooled melted butter or cooking oil and most of the 2/3 cup of milk, just enough milk to moisten dough. Add the remaining milk only as needed. Use a fork to combine. Dough should be wet, but not goopy. Turn dough out onto a floured surface and sprinkle a little bit of flour on top. Knead dough until it is smooth and no longer sticky. Pat dough about 1/2 inch thick and cut out close together with a 2-inch biscuit cutter, gathering scraps to make the last few biscuits. Place on a silpat or parchment covered cookie sheet. Bake at 350 degrees F for about 20 to 25 minutes. For more of my favorite biscuit recipes, visit my page on Pinterest! Preheat oven to 350 degrees F. Combine flour, ham, cheese and pickled jalapeno, if using. Make well in center and pour in the butter or oil and most of the milk, using a fork to combine everything. Add the remaining milk as needed. Turn dough out onto a floured surface and sprinkle a little bit of flour on top, kneading dough until it is smooth and no longer sticky. Pat dough about 1/2 inch thick and cut out close together with a 2-inch biscuit cutter, gathering scraps to make the last few biscuits. Place on a silpat or parchment covered cookie sheet, spaced about 1/2 inch apart and bake at 350 degrees F for about 20 to 25 minutes. Makes about 9 biscuits, depending on how you cut them. Cheese and Herb Biscuits: Omit ham and add in 2 tablespoons of chopped fresh herbs, such as rosemary, parsley, chives or your favorites. Muffin Tin Biscuits: Butter or spray a Instead of rolling out dough, add enough milk to form a sticky dough. Use a cookie scoop or spoon to fill prepared muffin tin and bake as above, until golden brown. Breakfast Sandwiches: Prepare eggs by cracking each into lightly greased muffin tins and gently breaking the yolks. Bake in a preheated 350 degree F oven for about 10-15 minutes, depending on how well done you prefer the yolks. Split biscuits and top with an egg. To Freeze: Let biscuits and eggs cool. Slice biscuits and add an egg. Wrap individually in foil and place into a zippered freezer bag; freeze. To reheat, preheat oven to 400 degrees F, place wrapped frozen biscuits on a baking sheet and bake 25 to 30 minutes, or until warmed through, unwrapping the last 3 or 4 minutes. May also freeze leftover biscuits in the same manner. Yum! 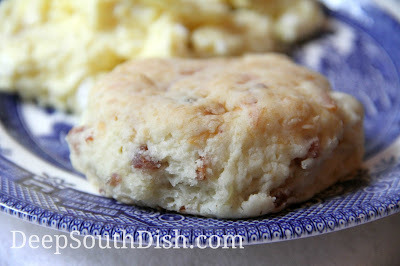 I make biscuits often and one of our favorites ways here is with ham and cheese. Yours look fantastic! It sure makes for a good biscuit doesn't it?! Sounds great, Mary! I love to cook and was just wondering, can you use buttermilk in this recipe? Alexis toasted some biscuits this weekend. She followed someone's recipe for buttermilk biscuits (we've never had a problem with mine, she just wanted something different) and cooked them at 500f. I told her they would be hard/dry on the outside and heavy in the middle and they were. Like you, I stay at 350, 400 max. Well.... for these, I do bake them at a lower temperature but for my regular buttermilk biscuits, believe it or not, I do go with the 500 degrees!! The ingredients have to be very cold and I have a few more tips on the page here. Hi Mary ...just ran across your site and the biscuits! They look really tender and delicate. Do you think they would hold up as the vehicle for an egg sandwich? I loved these ham and cheese biscuits. They were perfect. I made them with your pineapple glazed ham we had leftover the day after Christmas and it was wonderful. The kids and husband ate them right up. Thank you and Happy New Year! I can't believe 2018 is upon us! I know, right? Time is flying! Happy New Year to you and your family & I'm so glad you tried the biscuits!